Ok, so the Iran Deal is dead. While the world will be alert for any Iranian attempt at nuclear advancement, Pentagon watchers are more immediately worried about something else. A decade ago, Defense Secretary Robert Gates invited Russia to turn its anti-missile radars around, stop facing them at Europe, and point them at Iran. He even invited Russia to link them into NATO’s radar nets because, he argued, the next-most-likely threat out of that part of the world was Iranian missiles: particularly medium-range ballistic missiles that would be aimed at Europe — but fly, unreliably — over Russia to get there. Russia was considering the idea, Pentagon officials said. It was a common, almost tongue-in-cheek quip to reporters — Gates knew full well Putin was not going to do that. But he knew the distant Iranian missile threat was getting nearer. Republicans at the time took the warning, but did not heed it. Instead, they went full Monty, claiming questionably that Iran was developing long-range intercontinental ballistic missiles that in theory one day could strike the east coast of the United States. Suddenly members of Congress were appropriating funds for East Coast missile defense, especially politicians from east coast states, saying they wanted to get ahead of this merely potential threat. What did Congress ignore? Those medium-range missiles. Cut to Tuesday, and Iran still can’t hit the U.S. or Europe with anything, much less a nuclear weapon. But it can and has been sneaking missiles into Yemen and hitting Saudi Arabia and ships in the straits between Africa and the Arabian Peninsula, killing the troops of American allies. It’s part of their overall destabilizing meddling across the region. For the past year, at least, Pentagon officials, defense intelligence leaders, and top generals in the region have been echoing Gates’ warning with renewed alarm. Iran’s era of covertly spreading and testing medium-range ballistic missile technology has arrived — in this case, handed to the rebel Houthis in Yemen. President Donald Trump, National Security Advisor John Bolton, and much of the GOP establishment wanted to scrap the Joint Comprehensive Plan of Action , or JCPOA, saying that they could negotiate a new agreement that would stop Iran from spreading these missiles across the Middle East. They’ve offered no path to that goal — yet. They need to. But beyond talks with allies, Trump hasn’t said what comes next. What is the U.S. military going to do about it? What is the White House willing to do about it? “We will have to overcome Iran’s efforts to destabilize yet another country and create another militia in their image of Lebanese Hezbollah,” Mattis said, during a Riyadh visit in April 2017. Since then, a lot has happened in Yemen. Gen. Joseph Votel, commander of U.S. Central Command, frequently warns of Iran’s purpose in Yemen, and told Congress this February that his mission is to counter Iran’s “destabilizing” influence across the region, especially it’s spread of missiles and proxy wars. “Iran has extended its tentacles across the region through numerous proxies,” he said, including the Houthis in Yemen. What does that mean in plain English? 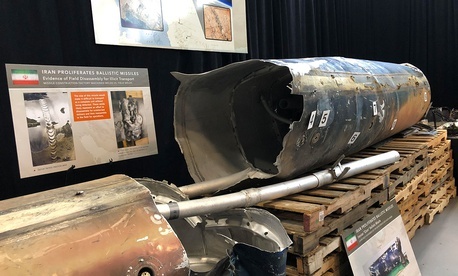 Defense intelligence officials have taken the extraordinary step of hosting show-and-tell sessions with defense reporters in Washington to walk them through Iranian-made missile remnants, drones, and remote-controlled IED boats picked up from Saudi Arabia and Yemen and sent to the U.S. for inspection. That’s what DOD wants the public to know about those missiles. Why? One reason: the Middle East would have four minutes to react to an Iranian missile barrage, and Iran’s missiles are flying farther and farther distances. But recently, New York Times reporters described U.S. special operations forces working with Saudi forces on the ground near Yemen. That’s what the White House and DOD has not yet wanted the public know — at least not to its full extent. All while Mattis and others ask Congress not to curb U.S. support for Saudi Arabia and UAE, who are defending against Iranian-armed Houthi strikes with less than precision strikes, causing civilian casualties at the hand of U.S. weapons. The Trump administration and the U.S. military continue to grapple with what they can and want to say about military and intelligence intervention across the Middle East. Yemen is no exception. But while Washington this week is staring at the ashes of the Iran Deal and worrying about Trump and Bolton ordering airstrikes into Iran, keep your eye on the proxy wars and ballistic missiles outside of Iran. The administration has signaled clearly it wants to do more to stop those missiles. That could include deploying greater numbers of American troops or operatives on the ground, which could mean more U.S. casualties. The potential for conflict with Iran over restarting nuclear centrifuges is a real concern. But there’s already a U.S.-Iranian conflict underway. Keep an eye on the centrifuges. But watch the missiles. Correction: A previous version of this story said that the New York Times revealed details of U.S. troops on the ground in Yemen. The Times report actually said American troops were in Saudi Arabia near Yemen.